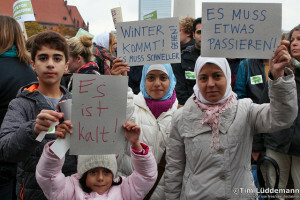 Berliners have been demonstrating today against the conditions at a registration point for refugees in their city. Tim Lüddeman (@timluedde) tweeted this composite image and a link to photos of the demonstration for non-commercial purposes with the hashtag #EsReicht (Enough!) that was the slogan of the demonstration, along with #LeGeSo, the German abbreviation for Landesamt für Gesundheit und Soziales (Provincial Office for Health and Social Concerns, much like the DHHS in the US). The LaGeSo offices have been criticized for long wait times, ineptitude and the development of a black market around the selling of paper numbers designed to create order in serving those waiting. On October 6, 2015 ZDF broadcast alarming images of mass stampedes outside the office, with hundreds of young men in hoodies and jeans pushing each other to try and get access to the building in the darkness of early morning. On October 8, 2015, Michel Friedman investigated LaGeSo on his television program on n-24, the German CNN-style 24-hour news channel. Die Welt has posted what seems to be an excerpt of this report on their website with commentary (Trigger warning for this video: Footage of near attempted suicide as protest). According to this article in Die Welt, over 18,000 refugees have arrived in Berlin since the beginning of September, when Merkel declared open borders. Homeless, without financial support, and understandably frustrated and angry, the young men featured in this video are spending their evenings sleeping in parks; their days standing in line for their numbers to flash on a large screen. From the hats and coats in the photographs of the demonstration, it is visibly cold. Winter is coming – and yet, their numbers don’t appear. Jaafar’s VLOG presents a calmer journalistic take on the conditions. Germany’s refugee crisis is producing two distinct political struggles: first there are the refugees, whose struggle in this humanitarian crisis for humane treatment seems endlessly traumatizing and often remains elusive. Last night at midnight, for instance, Hungary succeeded in sealing its border to Croatia to hinder refugees from entering their country; tonight, despite the protest, I suspect that refugees will still be sleeping in the cold in the park. The second struggle is an internal political struggle creating wide rifts not just between Right and Left, but also between the Right and the Far Right. The Greens recently helped pass a change in asylum law with which they are uneasy. PEGIDA-Chemnitz continues its two-week long protest against the construction of a new asylum home. In Cologne today, Henriette Reker, candidate for leading mayor supported by a broad coalition (CDU, Green, FDP, Freie Wähler) was stabbed by a right-wing extremist. Darkness and light are not static – they alternate as surely as night and day. During certain times of the year, however, especially in northern Europe, either one or the other predominates. Winter is coming.